This year we started the construction of what will be a spectacular new mountain top respite in the Allegheny Mountains of Western Maryland. Within several months, critically ill children and their families will be walking through the doors of the Believe In Tomorrow Children’s House at Deep Creek Lake. There, our families will find a restorative environment designed to help them relax, recharge, refresh and rebuild their lives. 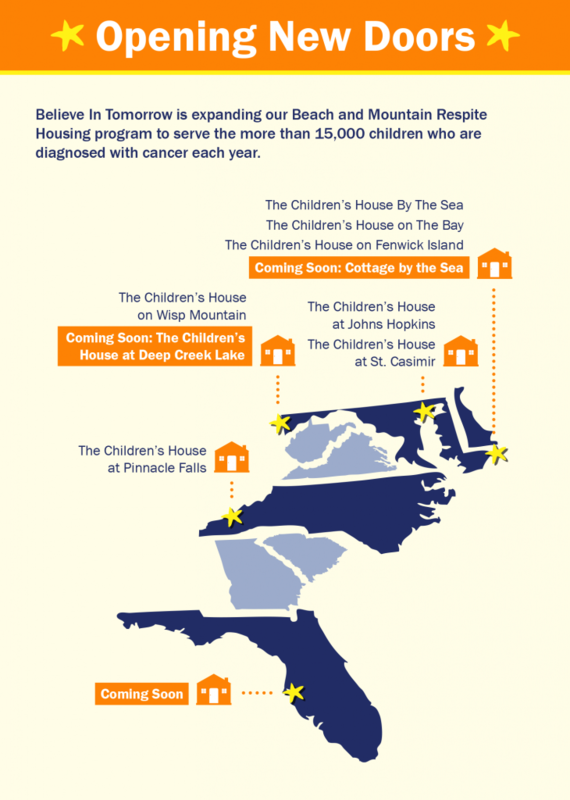 We are moving forward with plans to build new respite housing at the beach, with a major expansion of our Children’s House By The Sea, located just steps from the Atlantic Ocean. Your past support has had a tremendous impact on the lives of the children and families that we serve. Thanks to you, we have expanded and improved our Believe In Tomorrow services in order to meet the ever growing demand of families who find comfort, joy, and healing within our exceptional pediatric respite and hospital housing programs. We are committed to offering unparalleled service, beautiful housing and unique experiences, that bring families together when they need each other the most. As we enter the giving season, please consider how you might make an impact by supporting Believe In Tomorrow’s continued expansion. Together… We can Open New Doors that will make a meaningful difference in the lives of others. Click here to make your gift today.